MOSCOW, Idaho — Jan. 16, 2019 —An image from the international Cassini spacecraft provides evidence of rainfall on the north pole of Titan, the largest of Saturn’s moons. The rainfall would be the first indication of the start of a summer season in the moon’s northern hemisphere. A team of scientists led by University of Idaho doctoral student Rajani Dhingra and Department of Physics Associate Professor Jason Barnes published their findings today in the journal Geophysical Research Letters. Dhingra and her colleagues, who represent 12 other institutions and universities, identified a reflective feature near Titan’s north pole on an image taken June 7, 2016, by Cassini’s near-infrared instrument, the Visual and Infrared Mapping Spectrometer. The reflective feature covered approximately 46,332 square miles, roughly half the size of the Great Lakes, and did not appear on images from previous and subsequent Cassini passes. Media note: An image associated with the study’s findings is attached to the press release. Image caption: Top panel: Titan's north pole as seen by the Cassini Visual and Infrared Mapping Spectrometer. The orange box shows the “wet sidewalk” region, what analyses suggests is evidence of changing seasons and rain on Titan’s north pole. The blue box shows the expanded region in the bottom panel. Bottom Panel: Pictured is an expanded view of Titan's north pole. Dark blue arrows mark clouds. Red arrows mark the mirror-like reflection from a lake called Xolotlan Lacus. Pink arrows mark the “wet sidewalk” region. The black dot marks the actual north pole of Titan. Light blue arrows mark the edges of the largest north polar sea, Kraken Mare. Image credit: NASA/JPL/University of Arizona/University of Idaho. This project was funded under the National Aeronautics and Space Administration award NNX15AI77G. The total project funding is $287,252 of which 100 percent is the federal share. Top panel: Titan's north pole as seen by the Cassini Visual and Infrared Mapping Spectrometer. 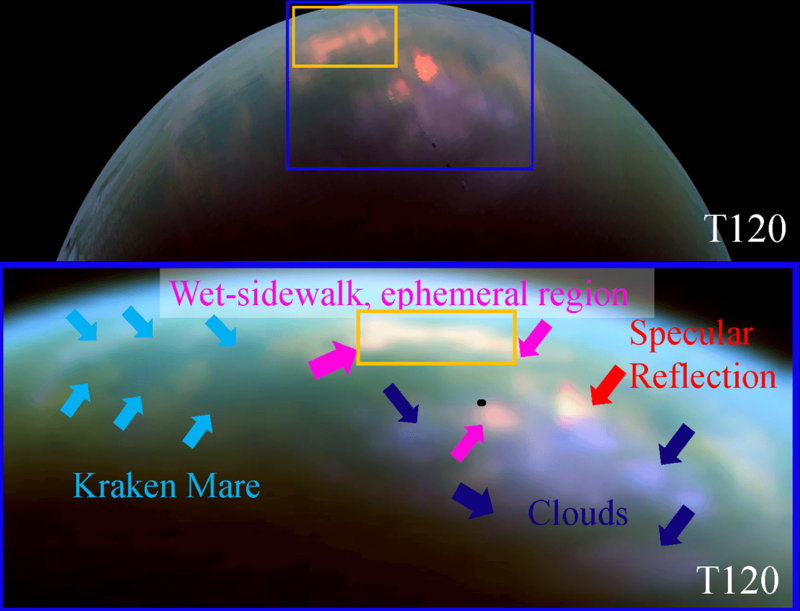 The orange box shows the “wet sidewalk” region, what analyses suggests is evidence of changing seasons and rain on Titan’s north pole. The blue box shows the expanded region in the bottom panel. Bottom Panel: Pictured is an expanded view of Titan's north pole. Dark blue arrows mark clouds. Red arrows mark the mirror-like reflection from a lake called Xolotlan Lacus. Pink arrows mark the “wet sidewalk” region. The black dot marks the actual north pole of Titan. Light blue arrows mark the edges of the largest north polar sea, Kraken Mare.